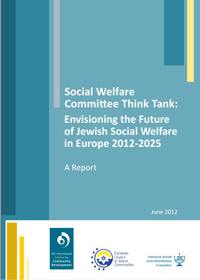 Europe’s foremost Jewish social welfare organizations met in February 2012 at the Jewish Social Welfare Committee Think Tank in Yarnton Manor, Oxford to explore their future in light of economic and social trends. Participants included representatives from Jewish Care (UK), Norwood (UK), FSJU (France), OSE (France), JMW (Netherlands) and Jewish welfare service providers from Latvia, Croatia, Hungary and Poland. The following report presents a summary of the discussions, including the lecture given by Prof. George Leeson (University of Oxford), sociologist and demographer specialist in population ageing.